This section of the website is designed for faculty and staff in teacher education/preparation programs in colleges and universities. Work through the tabs below for a foundational understanding of transition concepts, or to refresh your knowledge. 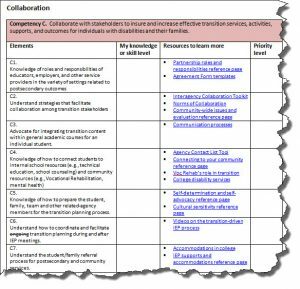 The sidebar links to other pages for faculty. The purpose of special education according to IDEA is to provide all children with disabilities a “free appropriate public education designed to…prepare students for further education, employment, and independent living”. 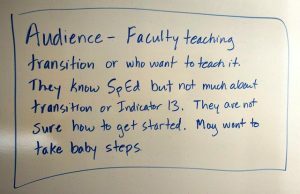 Transition planning and programming is a P-12 concept that all program faculty need to solidly understand. 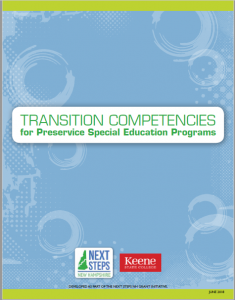 Most Special Education preservice programs stress the importance of transition planning and programming including the IDEA transition requirements but often this concept is not consistently addressed across a program. Transition planning focuses on designing activities and strategies for individuals with disabilities that are based on their interests and goals for life after high school. All too often both special educators and programs get lost in the academic supports and needs without providing the transition context that is so important for student success after high school. Transition 101 provides you an opportunity to build transition knowledge or review concepts you learned earlier in your career. Many resources exist about transition, and it’s easy to get information overload. The resources here have been used by other faculty who have found them useful. 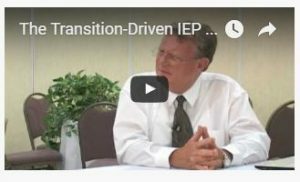 In 2010 Dr. Ed O’Leary and Dr. Steve Bigaj recorded 17 short interviews on elements of the transition-driven IEP process and Indicator 13 IEP requirements. The interviews provide clear, high-level overviews that capture the essence of good transition planning. If you’re a video person, you may want to watch all the videos. If you’re more of a learn-by-reading person, work your way through the Transition IEP Requirements: Training and Reference Tool pages, which also include the videos. Transition Education and Services from Birth to Adult for Individuals with Disabilities, from NTACT, is a one-page summary chart that give a good big picture view. Life After High School Transition Tool Kit is a 72-page guide for New Hampshire families. Skim it for a good overview. Go to the Drive Change in Your Own Practice section of the website to do the self-assessment and review resources to close your knowlege gaps.